The women, ill-equipped to endure a sit-in without food and shelter, are determined to maintain their position. Barbara attempts to comfort Doreen over her sacking. Judy decides that Susie needs a break. Susie/Jacqui Gordon appears twice in the credits, the first time in the place usually taken by Steve/Wayne Jarratt. Barbara offers to take Doreen for a coffee to explain why she had to sack her. Chrissie and Hannah object to Bea's insistence that the women stay outside, but she tells them no-one is going in until she says so. Barbara offers to write Doreen a reference, but Doreen tells her it wasn't the job itself so much that was important, but rather the idea of being accepted. The women stay outside until dark and light a fire in a skip to keep warm: Joan turns the fire hose on them . Hannah persuades Bea to give in and try again with another protest when they are better prepared. Doreen takes her sacking resignedly, but agrees with Judy that they should do something to help Susie. Erica tells Joan not to push the women too hard. Judy phones Joanne Slater to help get Susie out of her depression. Colleen tells the women they have lost privileges for a week. Bea returns from an overnight stay in solitary and tells the women she's agreed with Erica that they won't do the same thing again. When the women voice their dismay, she says she only meant that next time they will win. Judy tells Jo what has happened to Susie since she got out of jail. Colleen hints that it would be better for everyone if she played down her report of the incident in the grounds. The women's second protest is to barricade themselves in the dining room . A new resident, Eileen Connor, comes to Driscoll House: Gloria immediately starts to ask questions. Bea gets the women to agree to let Hannah out of the dining room for her court appearance. Joan refuses to get Lizzie's pills from her cell. Susie runs to her room when Judy tells her she has a visitor and she sees it is Jo. Jo follows her and appeals to her to come and live on the farm with her and the family. Barbara's boyfriend Phillip mentions a business deal which could benefit them both, but tells Barbara she will need capital. Barbara tells him that's no problem: she will just get it from her boss. Susie leaves the halfway house to go and live with Jo. Eileen offers to take Donna out to a contact to buy drugs, but when she finds Donna already has some, she says she'll be lookout for her when she's ready to take it. Lizzie refuses to leave the dining room, even though Bea tells her she can if she wants. 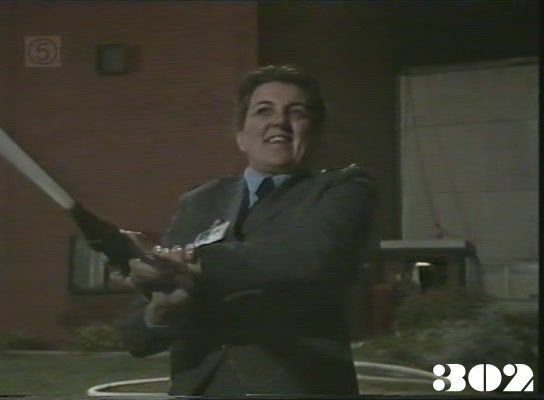 Eileen bars the door and tells Donna she's from Des: she pulls out a syringe and attempts to inject her. Gloria breaks the door down, shoots Eileen and arrests Donna. Barbara lets herself into the factory at night and takes $7,000 in cash from the safe, putting the rest back. She is disturbed by the sound of someone else in the building, and leaves the safe door open in her hurry to get away. Someone sets fire to the factory, trapping the night-watchman, but he also takes the remaining $3,000 from the safe. Bea asks for medical assistance from Lizzie, but Joan refuses unless the women give up their protest .